The observations showed that the two stars were traveling at high speeds in opposite directions from each other. The stars’ origin, however, was a mystery. Astronomers traced both stars back 540 years to the same location and suggested they were part of a now-defunct multiple-star system. But the duo’s combined energy, which is propelling them outward, didn’t add up. The researchers reasoned there must be at least one other culprit that robbed energy from the stellar toss-up. Now NASA’s Hubble Space Telescope has helped astronomers find the final piece of the puzzle by nabbing a third runaway star. The astronomers followed the path of the newly found star back to the same location where the two previously known stars were located 540 years ago. 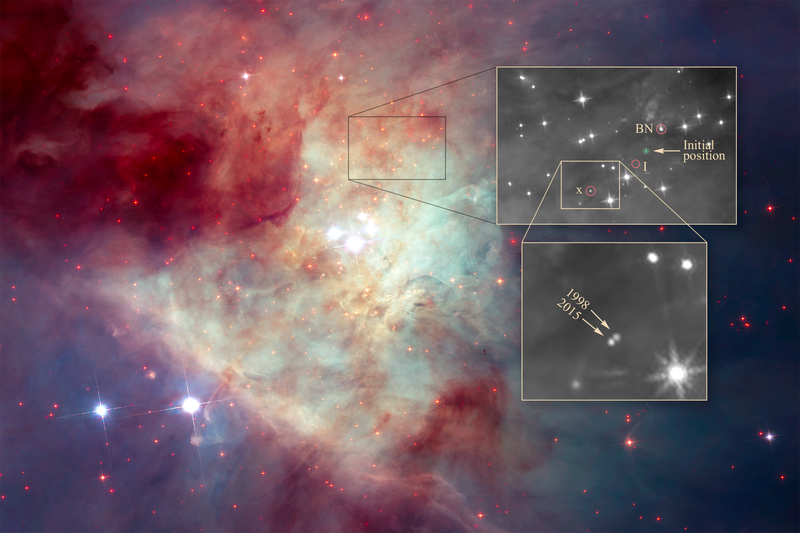 The trio reside in a small region of young stars called the Kleinmann-Low Nebula, near the center of the vast Orion Nebula complex, located 1,300 light-years away. The team’s results will appear in the March 20, 2017 issue of The Astrophysical Journal Letters. Luhman stumbled across the third speedy star, called “source x,” while he was hunting for free-floating planets in the Orion Nebula as a member of an international team led by Massimo Robberto of the Space Telescope Science Institute in Baltimore, Maryland. The team used the near-infrared vision of Hubble’s Wide Field Camera 3 to conduct the survey. During the analysis, Luhman was comparing the new infrared images taken in 2015 with infrared observations taken in 1998 by the Near Infrared Camera and Multi-Object Spectrometer (NICMOS). He noticed that source x had changed its position considerably, relative to nearby stars over the 17 years between Hubble images, indicating the star was moving fast, about 130,000 miles per hour. BN was discovered in infrared images in 1967, but its rapid motion wasn’t detected until 1995, when radio observations measured the star’s speed at 60,000 miles per hour. Source I is traveling roughly 22,000 miles per hour. The star had only been detected in radio observations; because it is so heavily enshrouded in dust, its visible and infrared light is largely blocked. The Hubble Space Telescope is a project of international cooperation between NASA and ESA (European Space Agency). NASA’s Goddard Space Flight Center in Greenbelt, Maryland, manages the telescope. The Space Telescope Science Institute in Baltimore conducts Hubble science operations. STScI is operated for NASA by the Association of Universities for Research in Astronomy, Inc., in Washington, D.C.
By The Space Telescope Science Institute (STScI) in Baltimore, Md.